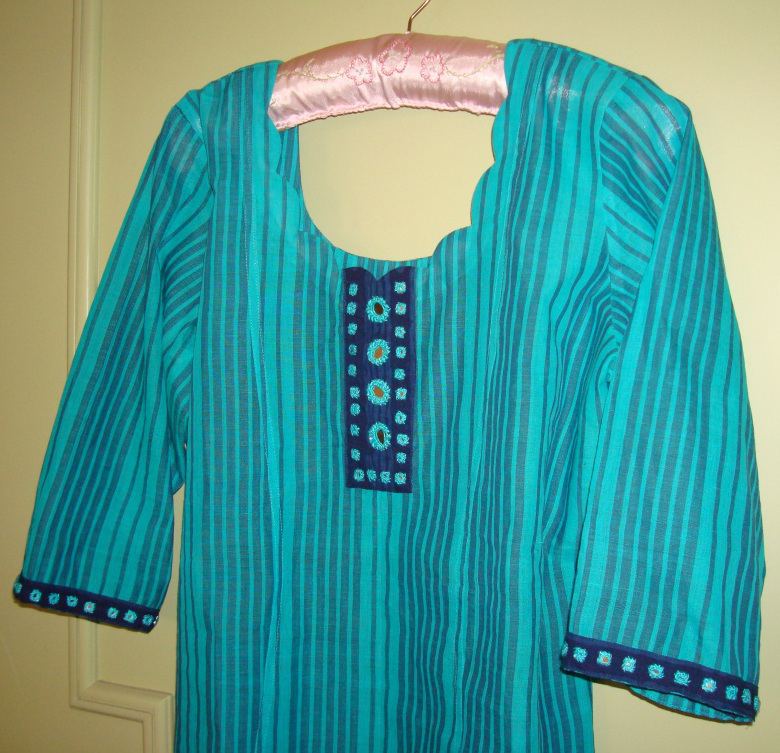 The fabric of this tunic is slightly rough variety of handloom cotton. 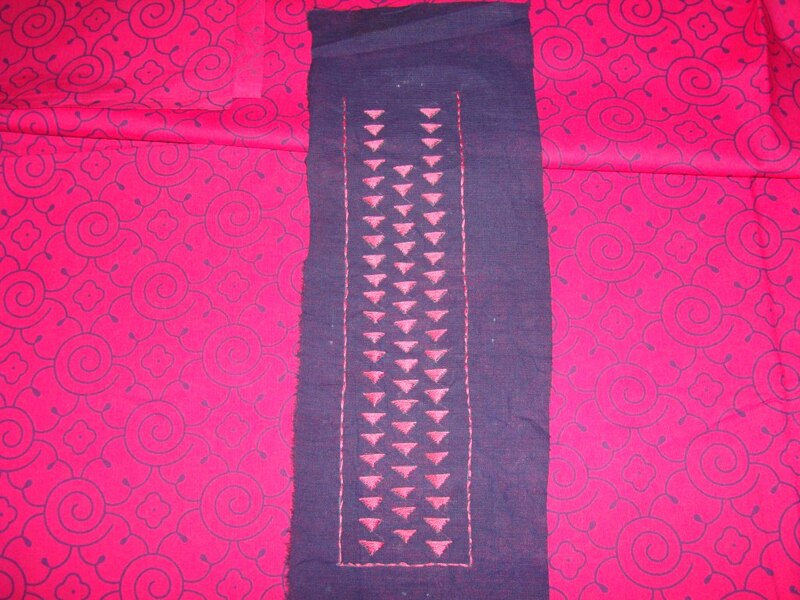 Because of its texture, when starched it maintains its shape like khadi fabric. The indigo stripes were the best match for jeans. 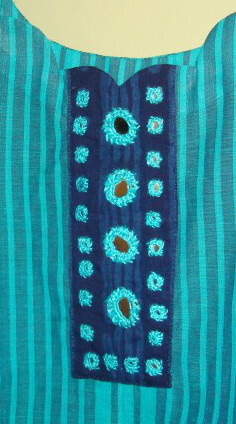 A block printed fabric with two shades of indigo was chosen for the mirror work on yoke and sleeves. 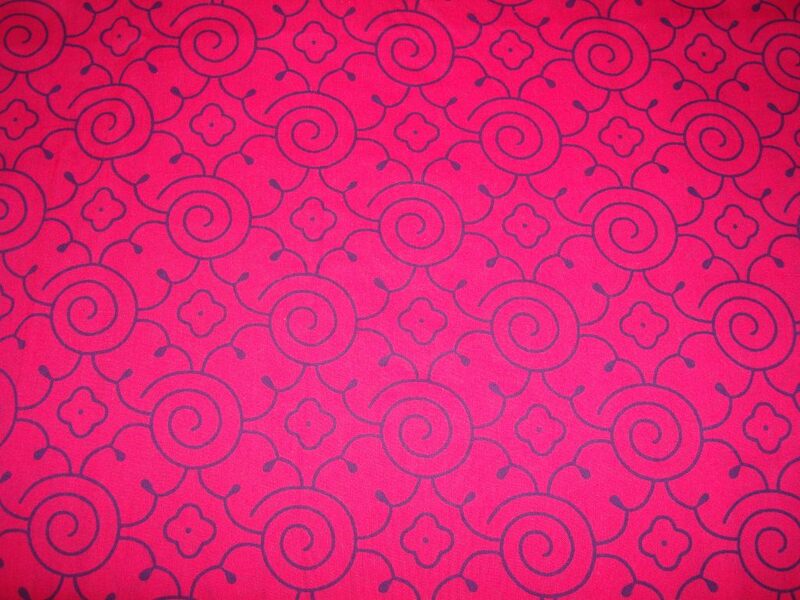 The indigo fabric had this block pattern of alternating stripes [four] and dots. The small square mirrors were worked over the dots. The medium round mirrors were worked on four evenly marked places. 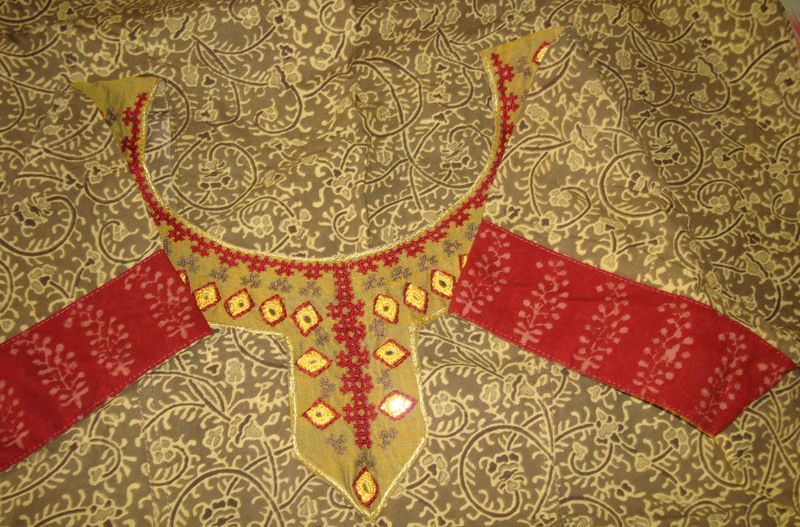 The sleeves had just the dots part of the fabric, with small square mirrors. A simple mirror work design with minimum effort. Ideal for people wanting to practice mirror work. 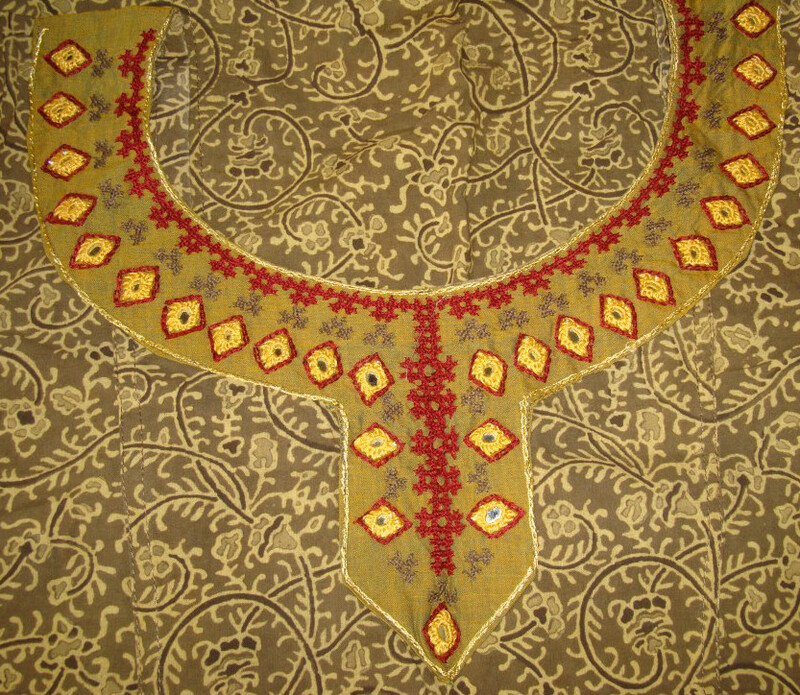 The detail of the yoke. After realizing the mistake of whipping these buttonhole stitches, today, a few more samples were worked with the reversed buttonhole stitches. 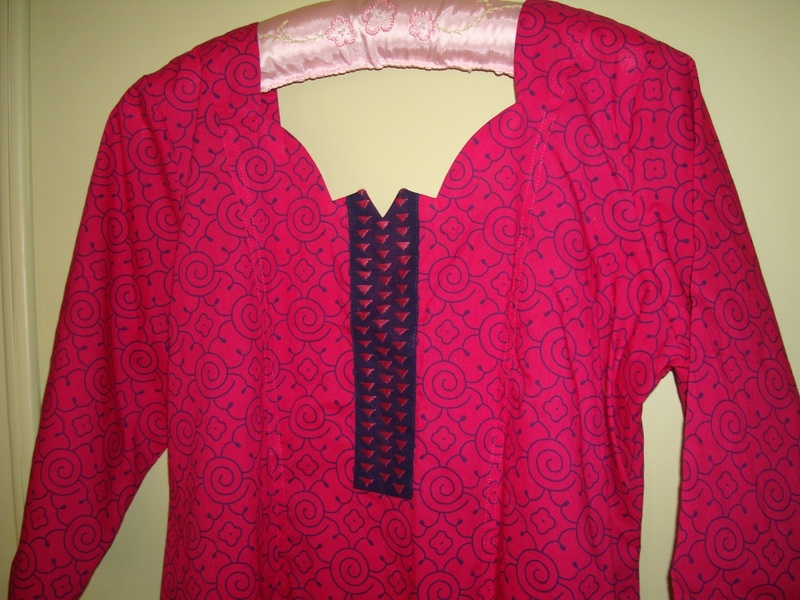 6.The first row is up and down buttonhole stitch over which this stitch was worked in pink. In the second sample, two rows of reversed buttonhole stitches are worked over closely worked buttonhole stitch. 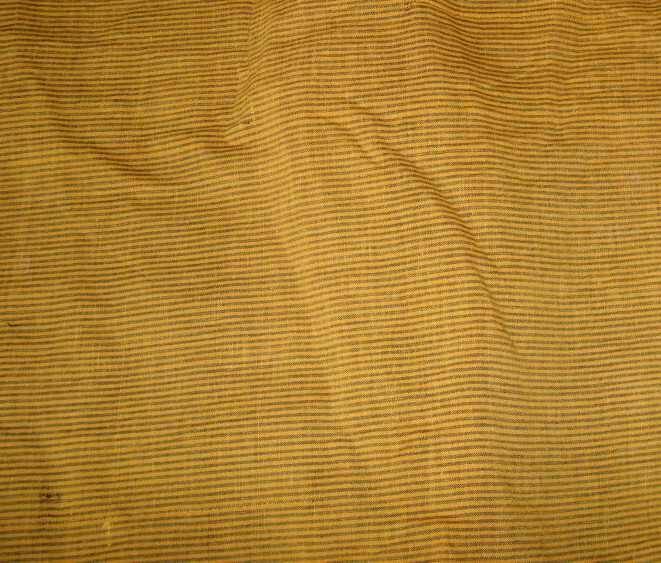 Reversed buttonhole stitches are worked over basque stitch in the third sample. 7.Reversed buttonhole stitches worked over two stitches in the first sample, again with an urge to work a braid, two rows of reversed buttonhole stitches are worked together over arrow head stitches in the second sample. I like this variation. Zigzag coral stitch worked with reversed buttonhole bar in the third row. 8.These samples are embellished with glass beads. I learnt and explored so many stitches in this challenge. My sampler with all the TAST 2013 stitches is thirty two feet long now. I am hoping that SharonB will introduce many more stitches. Her step by step approach has been easy to comprehend and follow. I have developed a liking for samplers, [earlier I thought they did not have any practical purpose], I have also learnt it is only by working and exploring a stitch I can really learn it. I have my own library of stitches with these samples. I have also gained some confidence to learn new things. 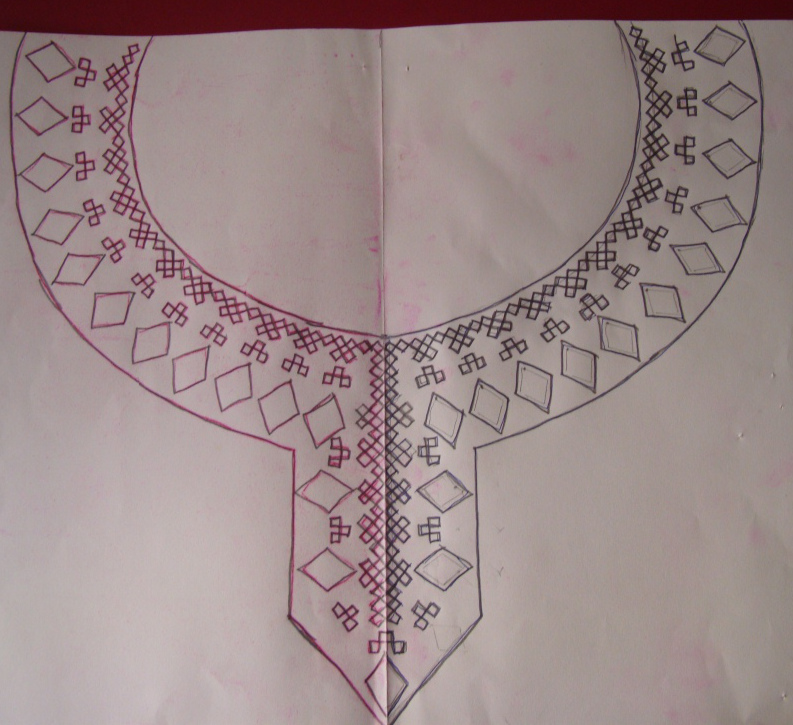 I have this dream to learn other ethnic embroideries, crochet, tatting, then work some samplers for reference. For this I need to manage the time, which is the first and foremost thing. 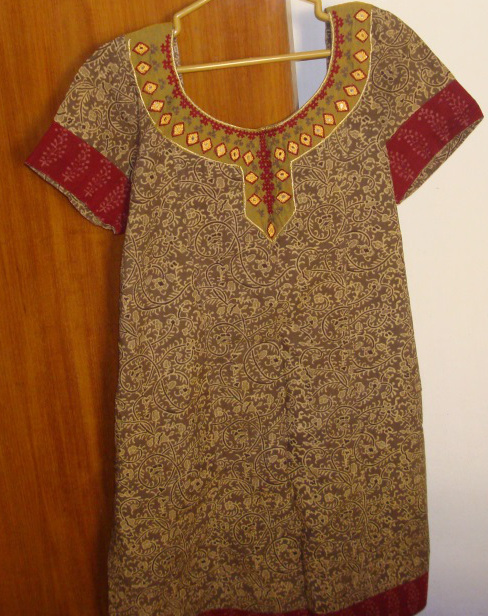 My time is divided between designing and embroidering tunics and TAST challenge. Then choose the types of embroidery which I want to learn, for this I need to segregate what I want [I want all of them!] and more importantly what I don’t want [which is very difficult]. I am still in the browsing the net mode. 4.The mistake starts in this sample, where I wanted to create a chained or braided effect over the buttonhole stitches, which I did by just whipping. Small straight stitches are worked over the buttonhole stitch rows in the next two samples, in the second row, the buttonhole stitch itself goes through the straight stitches and whipped with pink thread. In the third row, the whipping pink thread goes through the straight stitches. 5.Closed buttonhole stitch, bullion buttonhole stitch and top knotted buttonhole stitches are whipped in these rows. Here we have to imagine these samples with reversed buttonhole stitches to make this reversed buttonhole sampler! 1.Reversed buttonhole stitches are worked over the three lines of buttonhole stitches- in single line in the first, two lines in the second and in two shades of pink in the third. 2.Reversed buttonhole stitches worked in two ways around a circle in the first two samples. I like the second sample. In the next two samples they are worked in a curve. I wanted to bring the effect of a feather [done by Annet on her blog], but couldn’t manage to do so. 3.Reversed buttonhole stitches are worked on buttonhole stitch row pairs in these rows.